Absolute hemostasis is essential for a successful procedure. The physiological impact of minor blood loss is minimal; however, by staining tissues, masking tissue planes, and darkening the image through light absorption, it can make the procedure technically more demanding. It is best to operate slowly and achieve good hemostasis rather than accept minor bleeding and "push on." Invariably, the more slowly but deliberately one operates the faster the operation progresses overall. ■ Lumbar veins entering the inferior vena cava that,particularly with large lesions,may be at risk during medial mobilization. However, in most cases, these vessels are well medial to the line of dissection. There are several methods available to control bleeding, ranging from diathermy to conversion. If the bleeding point is small and easily seen, then simple diathermy with the diathermy scissors may suffice. A useful maneuver is to attach the diathermy lead to the dissecting forceps in the left hand and the sucker in the right hand. The sucker is used to clear the field of blood, and the bleeding vessel is then grasped and diathermied with the dissecting forceps. An endoclip may alternatively be applied. A left-handed surgeon may find the opposite easier. If the bleeding source is difficult to identify, a tonsil swab may be pressed down onto the bleeding area before definitive hemostasis is undertaken. Depending on the experience of the surgeon, the application of bulldog clips to gain proximal and distal control of a larger bleeding vessel such as a renal vein branch may be useful. These clips can be passed down a 10 mm port with a large toothed grasper. Similarly, direct intracorporeal suturing may be required; however, this may be difficult because the working space at the site of bleeding may be quite cramped. 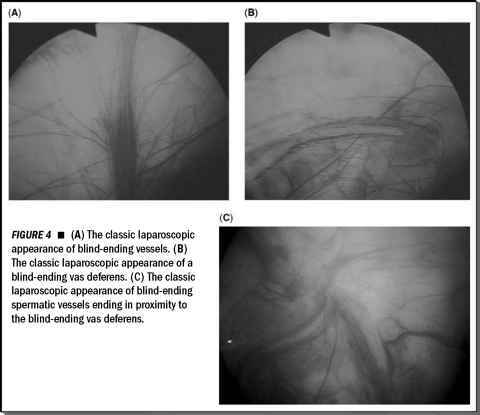 These latter methods require considerable laparoscopic experience and inexperienced practitioners would be best served converting to open surgery to control significant hemorrhage.